I had something almost worked up for today, but it didn’t feel quite right. We have been working our butts off on the house, so there is little time for much else lately. It is all our fault though. Anyway, not much time for writing either, so I’ll share with you a couple of the things we’ve been working on. I’ll have a more detailed post on my projects soon including one on my favorite skill in the world, tiling! However, that is for another day. Oh, but before I get to the projects, I wanted to emphasize how important I think DIY is for your bank account. These projects would have costs thousands in labor if hired out. For this house alone, I’m saving somewhere in the neighborhood of $75,000 just by doing the work myself. It is tough at times; my bike rides suffer and there are some late nights, but the money saved makes it so worth it. Now before you say, “I don’t have the skills,” neither did I 10 years ago. I just picked up some books from the library and watched some tutorials online. Feel free to ask me questions at any time if you’d like to try some of these projects yourself. Heck, if you’re in Colorado (or living on a beautiful tropical island), let’s work on a project together! One project which I hope to get done soon is our 3rd bathroom. I built the shower curb just now and hope to get the rest of it done within a couple weeks. I’ll be using MMM’s method to build the base. 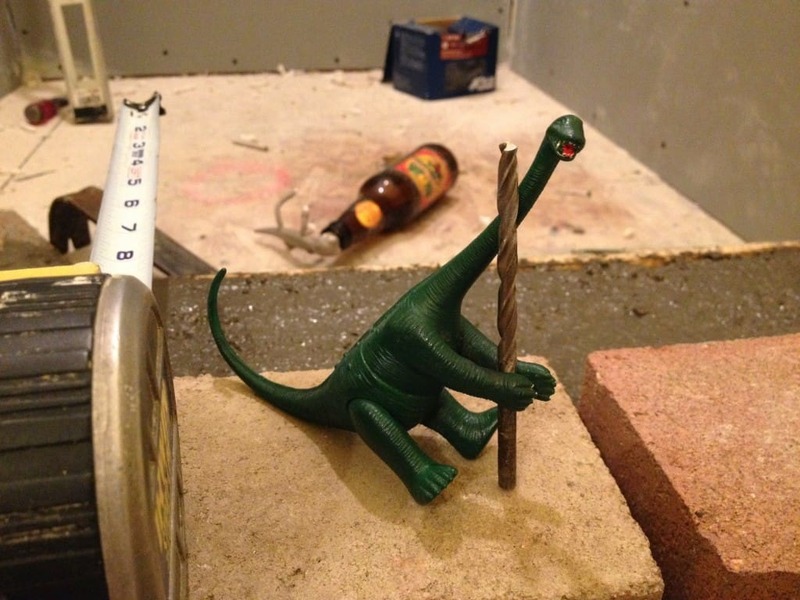 Frugalsaurus is a great assistant, anticipating what tool I need and always on time. Spendosaurus had other things* on his mind and was of no use whatsoever. We weren’t planning on installing wood floors until 2015, but then Home Depot had this great hickory on clearance. It was a deal too good to pass up. One other crazy thing; I bought that air compressor about 10 years ago at the local grocery store. I have no idea why a place that sells apples and meat was also selling these, but it was on clearance and I needed one, so into the cart it went. To my surprise, it’s still chugging along in fine form. Also note my plant from college in the lower left corner (20+ years old!). Here is a picture of a finished floor in our new dining room. 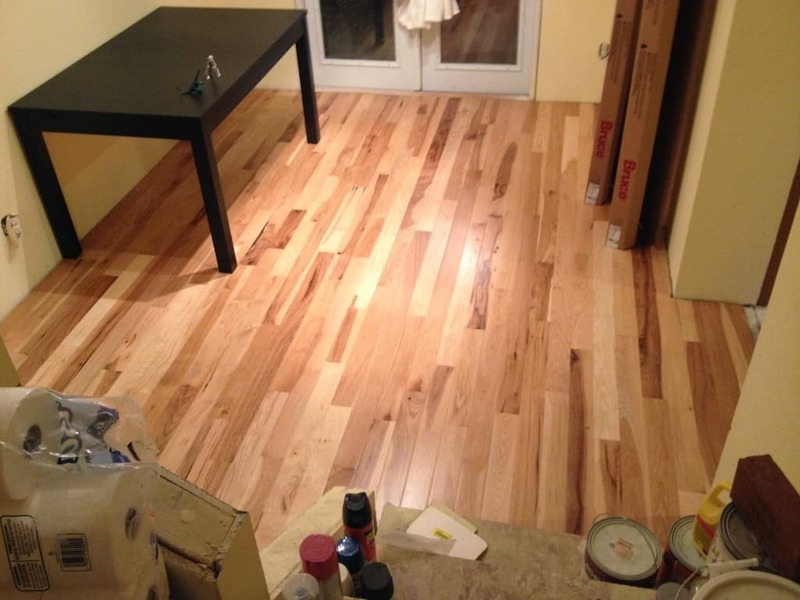 While the floor looks great, do you know what the best part of this is? I hardly did any of it! 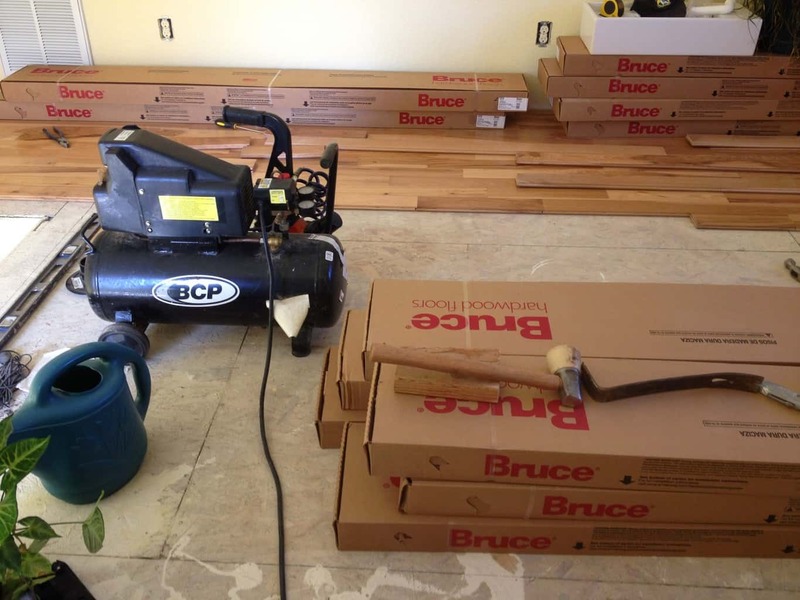 To my great surprise, last week Mrs. 1500 announced that she wanted to install the floors. Ummm, great! I got her started and off to the races she went. Also, I have no idea what that toilet paper is doing there. Finally, our town is also under construction. 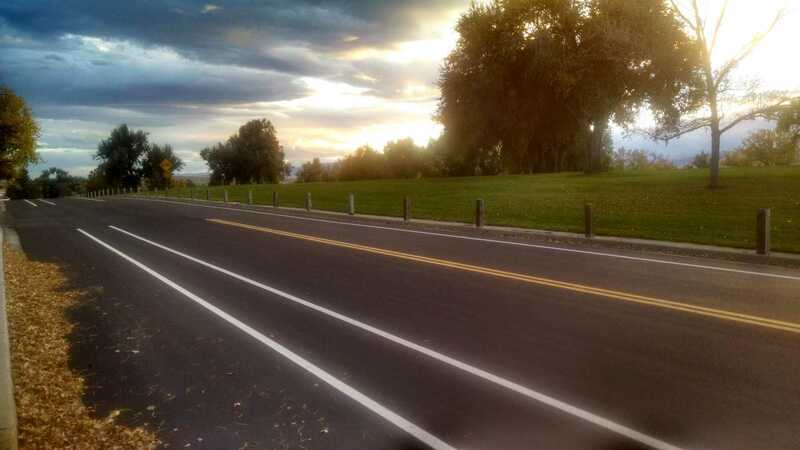 We were out this week for our evening walk and I was thrilled to see these new bike lanes on the fresh asphalt. I’m soooooo tired; time for bed. Tune in next week when I tell you about how I offered my tile skills to my neighbor for free, but they didn’t want to wait for me, so they hired a random person. The result isn’t pretty. 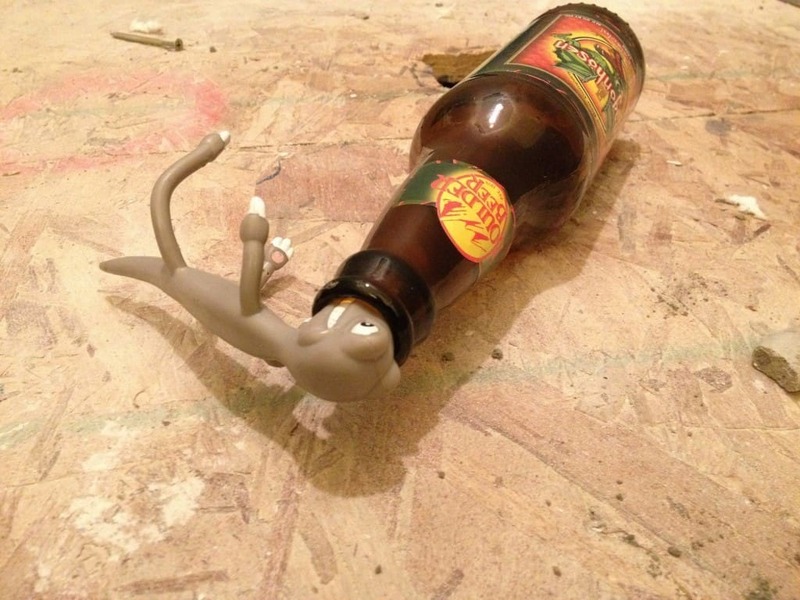 *Speaking of beer, don’t forget to tell us your home improvement story for a chance to win some nifty beer cozies from Ree at Escaping Dodge! The floor looks great! That was one part of our project that I was really worried about (and almost hired out in the middle of it) that I was able to figure out and went really smoothly. 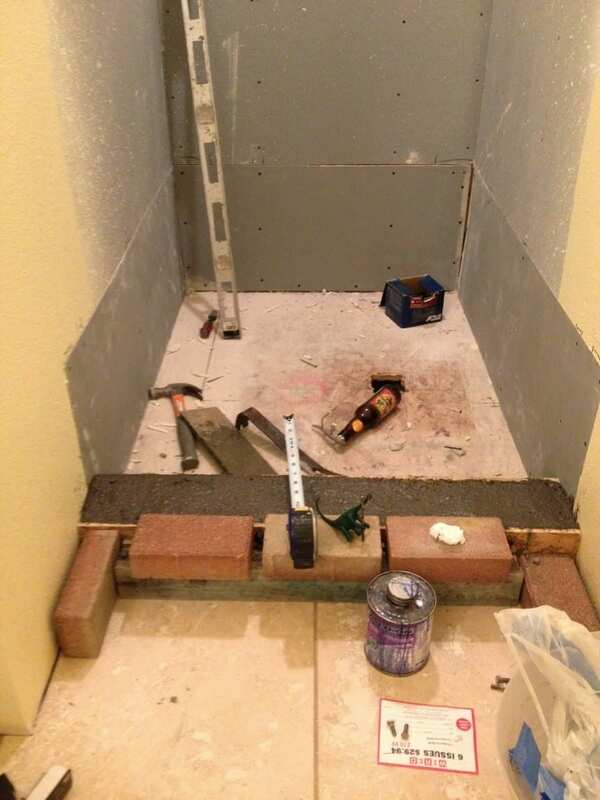 Big Guy Money recently posted…Remodel Recap: Done With DIY? Bleh, I would totally help if we were closer. I still feel terrible for you. The guy who sold you that crap should be forced to bathe in it. If you look at tile forums like John Bridge, there are infinite warning against using the pre-mixed stuff in a shower. I wouldn’t use it anywhere. Yep, I found the John Bridge forums right as I was searching for what the heck was going wrong and the answer was pretty definitive! Wow. Those are some mad skills Mrs. 1500. I just scrolled through the pictures and then read through. Thanks Roamer! Stay tuned for a full update soon. Mrs PoP @ Planting Our Pennies recently posted…How Much Money Do You Make? I will say we have slowly become more adventurous in the DIY. We have talked about re-sanding all of our doors down to the original finish instead of buying new ones(they were just painted over repeatedly), and the hard wood floor makes me think a little tile work in our place wouldn’t be so bad. I like the DIY when it comes to our own place, as you see I get a little hesitant on the renters and the time restrictions we face when updating is needed. Learning how to tile offers huge bank for the buck. The materials are cheap and it isn’t that hard. There is nothing like taking an ugly vinyl floor and making it look beautiful with some cheap, off the shelf tile from the local big box. Let me know if you need help since I’m in your neck of the woods awesome. I work for beer, good beer. Gotta love the helpers… where can I get a Frugalsaurus? He’s a good one to have around but Spendosaurus might be more fun! Averagehouse is quickly becoming Spectacularhouse. I am really knocked out by what the two of you manage to get done. Are you really human?!?!?!? Ree Klein recently posted…Income Lab 1.5: Writing a Killer Amazon Listing Just Got Easier! Ha, Frugalsaurus is almost 40 years old (had him since I was a boy), so good luck finding one! If you do get one, let me know where you found him! I am human, a very, very tired human. Mr. 1500 I would really appreciate a more detailed post on your adventure using the MMM shower base method. If you have any more pictures of this project I would really appreciate another post on that topic or maybe you could email me the pictures. I’ve read the MMM post repeatedly and looked on the forums but was not able to find a whole lot more information. I am planning to use this method to replace a fiberglass shower I have, but I’ve never done anything quite like that and so convincing the Mrs. I am capable with a few more pics would be really helpful! No problem! So far, I’ve only built the curb, so I’ll make sure I document the process thoroughly. I’ve built a base the old way and that was a bit painful, lots and lots of steps. MMM’s method seems a lot better; much simpler while still effective. So, if I do a post on this, it will be in November sometime. If I don’t do a post, I’ll email you directly. And I may be hitting you up for information too as home brewing is one of my goals for 2105. Love those floors! Way to go, Mrs. 1500! We’re in the same boat right now–we’re hosting Mr. FW’s family for Thanksgiving and mad scrambling to finish up several of our half-way completed projects. Specifically the missing wall in our kitchen (after our aborted effort to expose a brick wall…). “or living on a beautiful tropical island”–have you heard of the Isle of Cambridge? It boasts craft beer, 1 greyhound, and a very nice guest room ;)! Good luck and keep us posted on the projects. Want to come to Richmond and help me renovate my house?? 🙂 All expenses paid trip and we have lots of craft beer here! That floor looks great and I can’t wait to see the shower completed! We’ve been homeowners for about three years now and I’ve learned a thing or two, though I’m still pretty hesitant. My husband removed a broken window and installed a new one last month, though! Saved us at least $200 for installation. It’s definitely worth it to learn.